Experience that view and that feeling. Clear your mind in the heart of an Alpine idyll. Stop time in an Alpine-themed wellness centre. Feel the romance at every step. Sava Hoteli Bled: What a view! What a feeling. A visit to Bled clears the mind and awakens the spirit, causes romantics to get lost in dreams, motivates athletes, relaxes the soul and invigorates the body. Sava Hoteli Bled combines the best Bled has to offer – the stunning beauty of this unique natural setting coming into accord with harmonious energies and the healing power of thermal water. 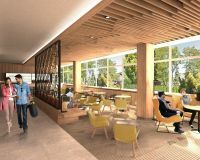 Swimming in the thermal pools, enjoying a relaxing alpine massage or treating oneself to a delicious original Bled cream cake – every experience with us will be crowned with the loveliest view of the emerald lake, the dream-like island, the romantic castle and the mighty mountain peaks. A wonderful view, a wonderful feeling! You can choose from among hotels that suit every taste and every one of them offers the loveliest views of Lake Bled! A famous song says “when you come to Bled, you'll be my baby again”. You should both come and check the magic power of Bled! Enjoy wellness treatments with an Alpine twist and soak in the pools and massage tubs with magnificent views of Lake Bled! 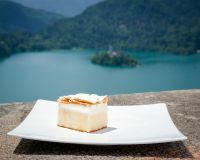 Bled’s culinary speciality comes from Sava Hoteli Bled. Treat yourself to the one and only original Bled cream cake! The bars and restaurants of Sava Hoteli Bled offer a culinary journey full of original and fresh flavours! A visit to Bled clears the mind and awakens the spirit, causes romantics to get lost in dreams and motivates athletes. Take a look at what’s available! In 2016, Bled was picked as the world winner in the sports destination category! Here you can cycle, row, swim, SUP, run and more.